Sometimes when we girls get consumed with work and the repetitiveness of school, we sometimes forget to pay attention to our hair. Whether it is dashing out of the house to get to school on time, or rushing overdue homework in the wee hours of the night, we all know that bad hairdos in the morning are massive mood dampener! While we all want a cute hairstyles for school, we also want to change it up and keep looking fresh everyday. These basic 4 hairstyles for long hair are classics! Learn how to do these looks and you’ll have hairstyles to last you throughout the year. They all can be changed to have an entirely new look, by slightly styling them differently and by adding a variety of accessories. When we first think of quick and easy school hairstyles, simple ponytails come to mind. They are great for any occasion, be it a day-to-day look or a formal event at school. But the challenge remains, how do we master the perfect long hair ponytail? For a clean look, make sure you first brush out all tangles in your hair. Then use a fine-toothed comb to sweep back your hair and tie your pony. If you have straight hair, comb and iron it for more extra sleek look before tying. If you have slightly wavy hair, add some mousse and use rollers to add more body and bounce to your hair. Ponytail hairstyles are worn straight back, high, low, half-up and to the side. Leaving some face framing layers out softens the look and makes it a more boho type of style. Adding accessories like headbands, scarves or big chandelier earings like Rhiannas, changes your look entirely. So, don’t settle for just one type of ponytail, when you can wear it multiple ways! Hair bands are certainly a girl’s best friend, you don’t need a particular hairstyle to pull it off and they are very affordable. Furthermore, you can experiment with a variety of hair bands, from the monochromatic to elaborate bows with added embellishments. Leighton Meester from Gossip Girl is well-known for pioneering the hair band craze. Wearing your hair down and natural is easy but needs some attention. With a spray of mousse or a bit of hair texturizer, your blow-dry style or curling iron style will hold. If you have long curls, scrunch your hair in an upward motion with a bit of mousse or light hair product to create a more defined natural curl. Wearing it down isn’t your cup of tea? Consider a ballerina bun instead. A low chignon or bun is another version of this style. It is a practical hairstyle and only needs a handy hair tie with some strategically placed bobby pins to hold it. If you feel too exposed pulling back all of your hair, you can wear your bangs down or just drop out a few loose strands on your forehead. Hair bands are a great way to add an extra touch to this style! Don’t forget the braids! There are so many ways to braid your hair and that adds diversity to your pool of hairstyles for school. If you are limited in the types of braids you can do, it’s well worth your time to learn some how-to’s. Have a get-together with girlfriends and make a night of it. Share your talents and practice on each other . . . practice does make perfect with braiding and you’ll have fun doing it! You Tube is full of video’s that give braiding techniques; bohemian braids, fishtail braids, a variety of french braids and such that are great school hair styles. OH . . .if you haven’t heard the latest, check out the new braid bars! This is a great idea for special events, they will teach you something new and they last for days! January 8, 2014 By: Barb Quinn Hairstyle Blog Leave your comments (2), Your input matters. Hairdressers who give haircuts to kids are under appreciated and underpaid. I admit it publicly, that I do not give this part of the hair business its due. I rarely write about kids hair, mostly because I didn’t take on kids as my clientele. It requires different skills, mind set and last but not least, lots of patience, to get these little moving targets styled quickly and quietly to every ones satisfaction. But if you’re finding it a little bit more difficult to get that hairdresser appointment in the past couple of weeks for your kids, its because it’s the busiest time of year at these hair salons. Back to school and hairstyles are synonymous. I know many of you who read my articles have kids of your own to be concerned about so when I spotted this piece from the The Charlotte Observer, I just had to pass it along. It really does have some good school hairstyles tips. Best Tip Advice: Leave your child and hair stylist alone if you want the job done right. Young kids act up and move around much more if a parent is standing by. Older kids feel especially doted over and controlled. Every styles I know GREATLY prefers you out of the surrounding area and may not know how to tell you this in a polite way. It’s also excellent for them to bond with a hairdresser and create their own relationship with them. They won’t mind getting their next haircut if they have an experience that isn’t a “push and pull” type of memory. It is well worth the read, especially for those moms out their who are trying to get the brood off to school without spending a bloody fortune. Experts’ tips help take the snags out of children’s hair care, for both parents and youngsters Here are suggestions for taming younger kids’ hair: As small children head to the classroom, they’re jamming hair salons and barber shops, accompanied by their parents. As parents try to tame the tangles of summer play or send their children to school with a new hairstyle hair-care experts have advice on caring for kids’ hair — and how to teach the kids to do the same. Earlier this month at the Supercuts on Providence Road, Elizabeth Holtz clutched her stuffed Dalmatian dog and grinned into the mirror. Snip, snip, snip went the scissors through the strawberry blond strands. It was the 5-year-old’s first haircut. She was unflappable. It was mom who was having a hard time. The dramatic change wasn’t a rash decision. It had been months in the making. Elizabeth wanted to follow her mom’s example and donate her hair to Locks of Love, a group that makes wigs for children suffering from medical hair loss. And it was time for another reason: Elizabeth is entering kindergarten and her long hair ‘is a little much to manage,’ Blake Holtz said. When it’s time for a child’s first professional haircut, there are ways to make it easier on everyone. Some salons, such as Doolittle’s, cater to the youngest kids by stocking toys in the waiting area and providing salon chairs that are shaped like cars. Damian Johnson, owner of No Grease! Barber College in east Charlotte, suggests that parents stand back a little and let the hairdresser take over. All experts interviewed said it’s a good idea to take the child to the same hairdresser each time, so a bond can develop. As with adults, how often kids should have their hair cut depends on the hairstyle. In Charlotte, kids’ cuts tend to range from about $10 to $20. Generally a short cut and bangs will start looking ragged after about six weeks, several hairdressers said. Longer, unlayered hair needs to be trimmed less frequently, about every eight to 12 weeks, depending on rate of growth and split ends. Some stylists offer free bang trims. 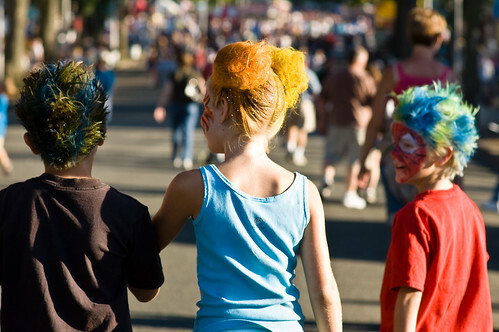 It’s State Fair time again and the thought of a back to school hairstyle is reluctantly on the minds of just about every kid you see. State fair hairdo’s, carnival hair, rainbow hairstyle creations, you’ve seen the ones I’m talking about, there b-a-c-k! Whew! First time I saw these hairstyle creations, I was creeped out! Not only was ‘fair hair’ a little creepy, but it looked like these do’s, which resembled neon colored, ratted up birds nests that glitter, had to be an absolute nightmare to get out of the hair! So what’s the attraction? “Summer Hair then Back to School Hairstyles”The way I figure, kid’s find the idea of looking eerie and creepy and the opportunity to stand out in the crowd for a day, overwhelmingly tempting and work their charms to convince the folks to open their wallets for the cause. This last hurrah to do something a little wild and crazy before getting serious about a back to school hairstyle. The kids are lining up already to get their back to school hairstyle ‘fair hairdo’s’. Choosing to wear these hairstyles seem to have become a passage of sorts . . . one last wild fling before heading back to school! Back to school hairstyles come in every shape, color and form, and these hairstyles are part of the mix! August 26, 2012 By: Barb Quinn Hairstyle Blog Leave your comments (0), Your input matters.